Many students in our schools are orphans. They either have been abandoned by their parents or their parents have died due to illness. Some are living on their own and some are living with extended family. Even living with extended family, these students are often not seen in the most positive light in the culture. We are pleased to extend our ministry to include sponsorships of these orphans that attend our schools. Your support can ensure these students STAY in school by being able to obtain the proper school supplies, vaccines, clothing, and food. 100% of your contribution goes directly to these students. You will be able to write to your student and will be kept up to date on the student throughout the year. Please click below and set up a monthly payment and be sure to note the student you are sponsoring! 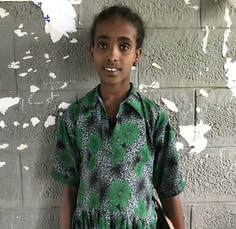 Tigist is one of our students in Areybia, Ethiopia. Tigist is a great student. Her favorite subject is English. 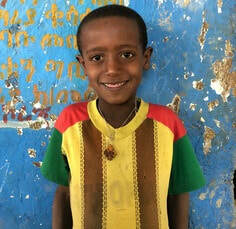 Chalachew is another one of our students in Areybia, Ethiopia. Chalachew is a great student. His favorite subject is English. 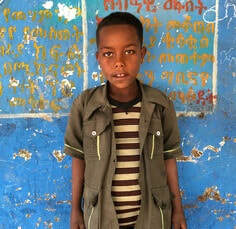 Takele is a student in our school in Robit. 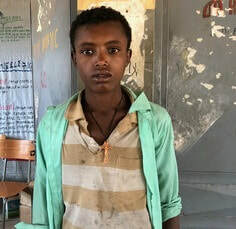 Takele is an amazing young man that has been trying to work in order to support himself so he can by food and go to school. His favorite subject is science. Mastewal is Takele's older sister. 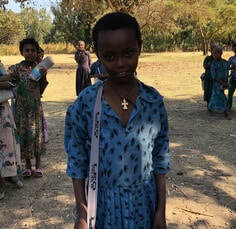 Mastewal is a student in Robit, Ethiopia. Her favorite subject is Amharic. 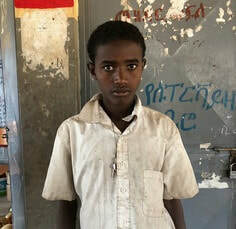 Alemnesh is a student in Robit, Ethiopia. She is a great student. Her favorite subject is Amharic. Banchi is a great student in Areybia. She is 12 years old and is in grade 3. She lost her mother and she now lives with her grandmother who cannot support her. 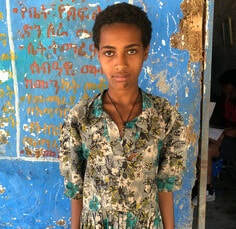 Masarie is a student in Areybia. He's a very good student who wants to continue his education. he is 13 years old and is in Grade 3. He lost his father and now lives with his uncle who is by himself. 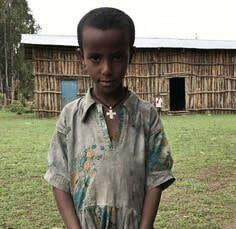 Cherenet is a student in Areybia. He is 10 years old and is in Grade 4. He lost his father, the breadwinner of the family and now lives with his mom. 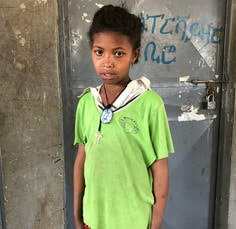 Two of his siblings have already dropped out of school in order to support the family and Cherenet doesn't want to have to do the same and wants to remain in school. 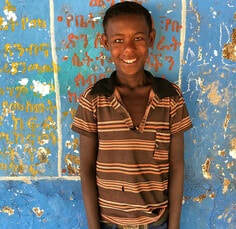 Telanesh is a student in Areybia. She is 12 years old and in grade 4. She lost her mom a few months ago and is now living with her father and is looking after her siblings. When we met her she had her baby sister under the cloth she is wearing. She very much wants to stay in school and her sponsorship will allow her to do that. Yeshenew is a student in Robit. He is 9 years old and in Grade 2. He is all smiles! He lost his mother and is now living with his father. 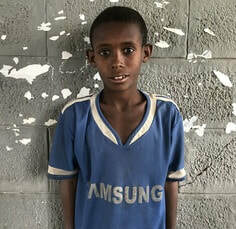 His sponsorship will help him to stay in school and not have to help his father earn money for them to get food. Semenesh is a student in Robit. She is 8 years old and in the 1st grade. Her father died and she now lives with her mother who has a mental disorder and cannot provide for her. This sponsorship will allow her to have food and to be able to stay in school so that she may make a better life for her and her mom. 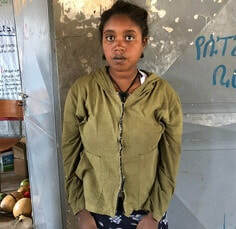 Alebachew is a student in Robit and is 15 years old and in the 5th grade. He started school later due to him loosing both of his parents. 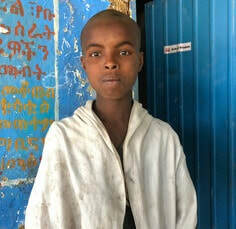 He now lives with his uncle and wants very much to stay in school. Desalegn is a student in Robit. He is 16 years old and is in the 5th grade. Desalegn has recently lost both of his parents and is currently staying wherever he can. He spends a lot of his time asking for help from a generous people. This sponsorship will enable him to stay in school instead of begging and be able to change his life. Saleamelak is a student in Robit. She is 15 years old and is i the 2nd grade. The lost her father recently and is struggling living with her mom. Meretzer is a student in one of our newer schools, Dablo. She is 9 years old and is in the 2nd grade. She lost her father who was the main provider and now lives with her widow mother. Both are students in Dablo. 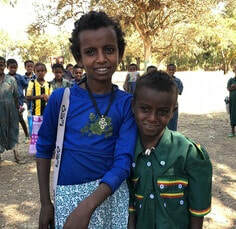 Zenebu is 10 years old and her brother Habtamu is 7 years old. They lost both of their parents and they currently live with their aging grandparents. Both want to stay in school and this sponsorship will help ensure they stay in school and be able to provide a better life for themselves and their grandparents. 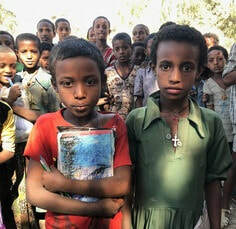 Both are students in Dablo. Asefu is 10 years old and Asemare is 11 years old. Both are in the 3rd grade. They lost their father and currently live with their widowed mother. This sponsorship will help them to remain in school and provide a better life for them and their mother! Sponsorship Level: $70 for both or $35 individually. Please note which!